Glissaria is a mix of tower defense, match3, and rpg. Scroll the rows/columns on the resource board to match 5 resources. When they become black, scroll them off the board to collect them. Use these resources to build/upgrade towers. 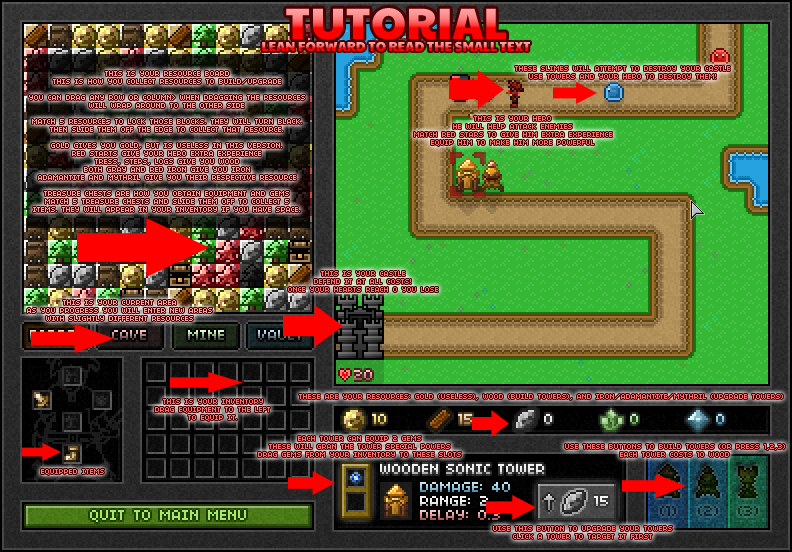 Use the bottons in the bottom right to build your towers (hotkeys 1, 2, and 3). 1 is short range but fast speed, 2 is medium range medium speed, 3 is long range slow speed. Each tower costs 10 wood to build. Match starts to give experience to your hero, and treasure chest to gain items. You will get equipment to equip to your hero and stones to grant powers to your towers. Remember to equip your items! Each tower can have up to 2 stones equipped. Target a tower to view the 2 stone slots. Hit escape when you have a tower targetted to view your hero's stats. Press 0 to mute. In addition, many other improvements and features will be added to the post-compo version, such as a story mode, tutorial, more maps, ability to buy gems with gold, and many more stone types.